Last week, I had to go to Sam’s to pick up some ribs to cook for one of the Jawja cousins who was rolling through town and was going to be spending the night with us (that’s Georgia, for the rest of ya). While there, I was perusing the meat section, looking to see if anything looked good. Brisket looked good, but I didn’t have the time to smoke one of those, let alone enough mouths to feed it to. Short ribs looked good, and I thought about it. Mrs. G is always asking me to make her Braised Short Ribs in a Red Wine Sauce. And then right next to it was more short ribs, but cut differently…flanken-cut beef short ribs. 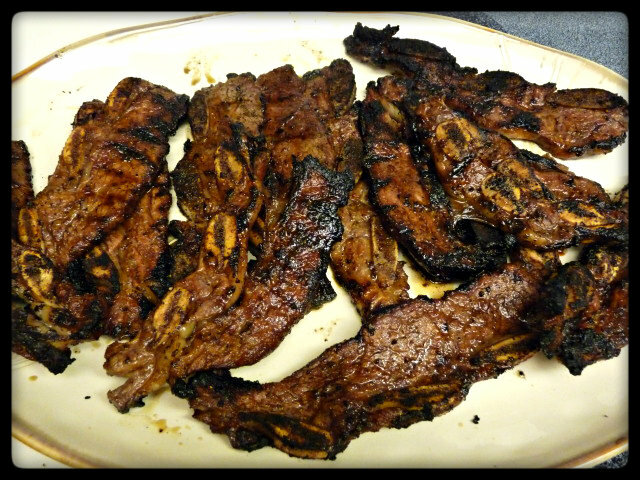 I really didn’t know anything about this cut other than its used in Korean BBQ, bulgogi and kalbi, but always being up for a challenge (even if it was self-issued), they went into my basket. I figured it had been awhile since we’ve had my parents over for dinner and this would be a perfect Sunday night dinner to share with them. Not sure what to do with them, I looked up a few things on the internet and asked on some bbq forums for a bit of advice. I was kind of shocked to see that the majority of the recipes had an Asian spin to them. It was really difficult to find anything that didn’t lean in that direction in some way. Figuring that was some kind of sign and that I should probably go that route, I opted to combine a few of the recipes and come up with my own. Set up grill for direct cooking and preheat to 450 F or medium-high heat. You should be able to hold your hand 4 inches above the grate for about 2-3 seconds. 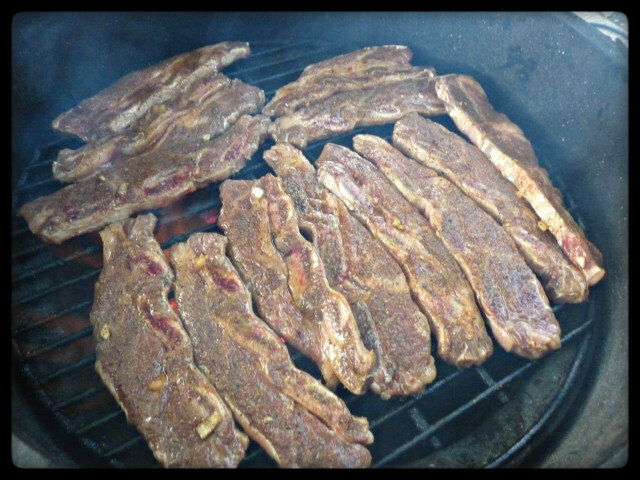 Grill beef ribs for about 3-4 minutes and then flip and cook for an additional 2-3. 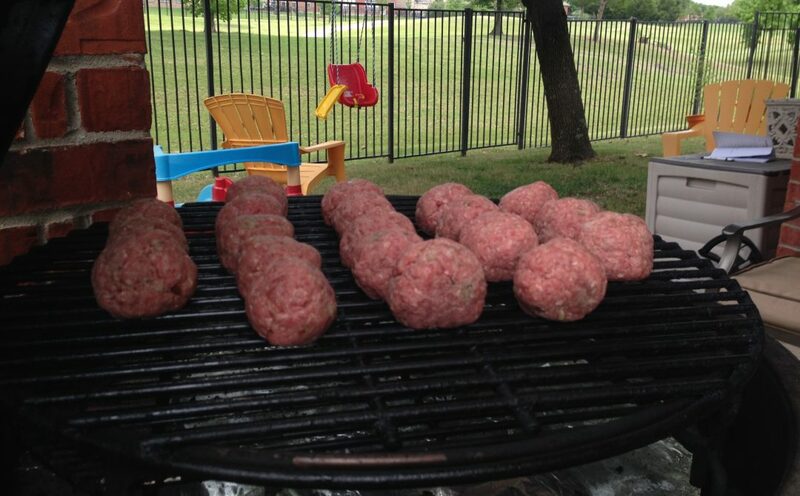 Be very careful and keep a close eye on your grill. There will be quite a bit of fat dripping off and flareups will occur. Now is not the time to go and get a cold beverage, answer the phone or talk to guests. Focus on the meat, moving it to avoid flareups and to make sure all ribs cook evenly. Remove ribs from the grill when lightly charred on both sides and allow to rest for 5 minutes before serving. Talk about an amazing combination of flavors! 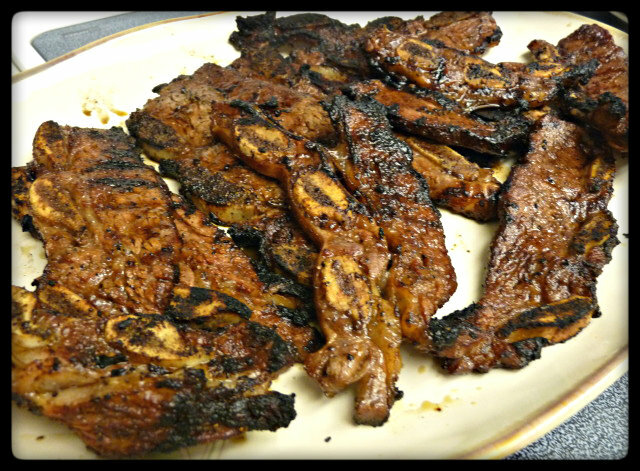 The ribs had an intense beef flavor combined with an underlying sweet and salty flavor from the soy sauce and sugar. 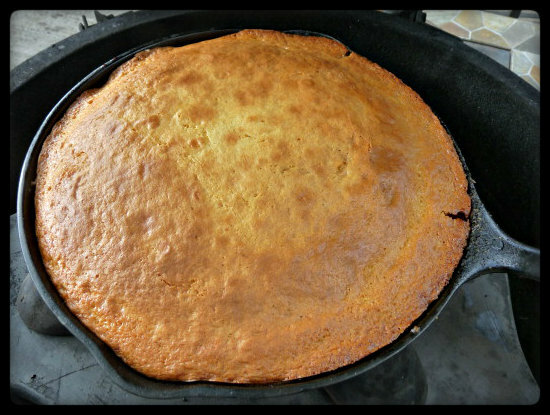 Extremely tender and the char from being cooked over lump charcoal took it just one step further. Nothing but silence for the first few minutes as my family began eating. You can’t ask for more than that. The ribs were served up with some roasted potatoes that Mrs. G whipped up along with a salad. 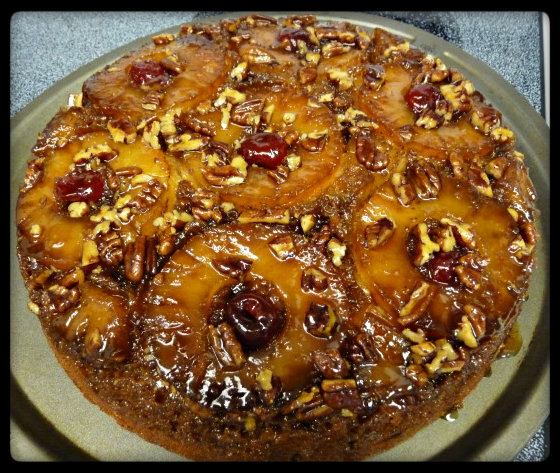 And since things have been so hectic for everybody lately and we totally missed celebrating my Dad’s B-Day, earlier in the day, I had whipped up a Pineapple Upside Down Cake (which is his favorite). He had never had my version cooked on the Egg and I think he was more than pleased with it. Time spent with family and good food….perfect way to end a crazy week. Have never seen that cut — looks super yum, as usual! I am so excited to see this! 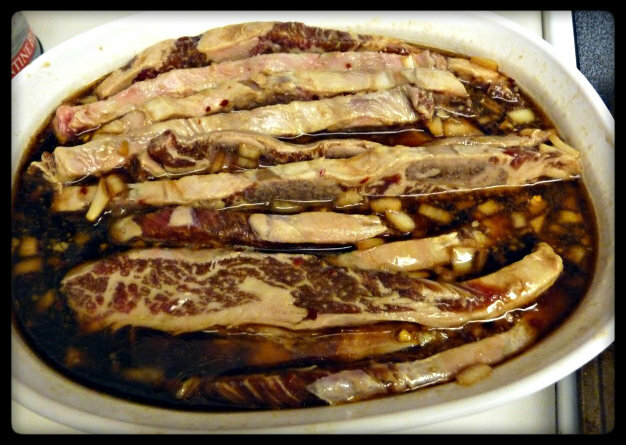 I am pinning this recipe and will make it for my son-in-law (who is Korean) and his mom makes the most wonderful bulgogi all the time………..Now, thanks to you, I will try my hand at it! LOL, so glad you explained Jawja, I was thinking it was those sand people from the original Star Wars movie. I’ve got to try grilling short ribs cut up like that. I think those were Jawas…. Mmm. You can invite me over for this meal anytime! I’ll let ya know next time we make it. Man I really effing love what you’re doing here. Keep up the good work!! Thanks, like yours too. Great blog name. Oh! So this is what you did! Creative. The charring looks delicious. Just wish to report we tried this recipe tonight on the kamodo and loved the flavor imparted by the marinate. Lovin’ the web site and looking forward to giving some more of your recipes a test drive. Thanks!! !